Rudy and Flor pastor two churches and are involved in a number of outreach Bible studies that have the potential to become new churches. 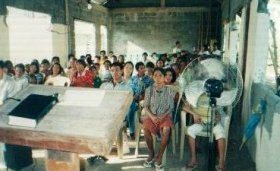 They have been working in Ranao-Ranao, in Ligao City, since 1993 and there is a group of 90 people meeting in the church. This project is providing financial support for Rudy and Flor so they can spend more time in ministry and do not have to worry about daily financial needs. It also means that pastoral care is being provided to churches that have no resident pastor. Len and Mary Savill are from New Zealand and went to the Philippines many years ago. While there they were part of establishing Emmaus Church Planting Ministries (now Empowered Christians in Partnership and Ministries). ECPM trains people in church planting and then sends them out to areas where there are no churches. Some years ago Rudy and Flor went to Ranao-Ranao to plant a church. As of now, there are 90 believers regularly attending the church. Rudy and Flor Ortiz are thankful to God to see how the believers are improving in their Christian faith. The church at Ranao-Ranao have been involved in establishing a number of new fellowships / churches with Rudy and Flor leading this. They visit these groups regularly and Rudy is training more leaders from the church to assist him with leadership. The beneficiaries are the Ortiz family and those they minister to. We like this because the leaders are long term and have proved themselves. There is also a good structure around them for accountability and encouragement. 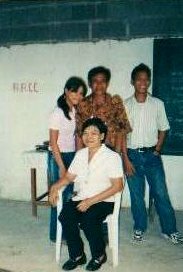 Rudy and Flor converted to Christ after being part of the New People's Army (the communist insurgency in the Philippines) during the Marcos era. They were used to living in extremely rugged conditions as teenagers, when they formed their common-law "marriage" and had their first child. After several years away from the region where their reputation was not good, they have returned as Christian missionaries to their own people. They are respected by both the people in the villages of the plains and also by the rebels who live in the hills. As long as they avoid any direct relationship to the politicians and the military they have access to villagers for the sake of the gospel. They were trained in an Emmaus church-planting team and have added skills in discipling to their natural gifts of evangelism. Rudy and Flor have six children, four of whom are married, two still at home. Cristy Cyril is at college taking mechanical engineering. She also is leading ministries in the church so this is a family team. Natanael is at high school. Flor has had two strokes and is not well. She is therefore unable to do hard work which puts extra pressure on Rudy. Flor often goes with Rudy to the difficult areas to help him and this is sometimes dangerous. There are many poor people in the area and sometimes Flor wants to quit but she stays because of the needs of the people. They believe the Scripture that God has promised to be with them. On the church property they have developed a small Christian camp site. Groups come to use it and they run camps for young people. They live between their adjacent house and the camp site. Their life is a 24/7 available affair. The annual strategy is to continue doing evangelism, Bible studies, running a Sunday school and youth programmes at Ranao-Ranao. They will also mentor the leaders of other nearby church planting teams.